The new Nikon D610 was announced on October 8! The Nikon D610 is an update to the D600. It has a new shutter mechanism with improved performance. Continuous shooting is now 6fps (instead of 5.5). A new quiet continuous shooting mode now offers 3fps. Minor Improvements were made to auto white balance. Nikon D610 Pre-order now available! The D610 is expected to ship on October 18, 2013. Pre-order now to assure first availability. UPDATE: Nikon D610 body only is now IN STOCK at B&H Photo! Nikon D600 + 24-85mm VR Lens at B&H Photo $2096.95 + 4% Reward + Free WU-1b wireless adapter, monopod, 16GB SD card, shoulder bag and extra battery. Nikon D600 (body only) Bundle #2 at Adorama $1896.00 + 4% reward + Free Accessories: extra battery, slight scoop, camera bag, 32gb SD card and Manfrotto monopod. The Nikon D600 is here! It is the smallest and lightest full-frame DSLR to date. This highly-anticipated camera could become the most popular full-frame camera yet. Nikon has stated they will have D600 ready for initial delivery beginning September 18, but if you want to get your hands on the D600 anytime soon, you need pre-order now it to get it! If you wait to order it when it is actually shipping, you could have to wait weeks or months. We saw this with the last full frame camera from Nikon, the D800. Those who pre-ordered very early or who knew right retailers to check at the right time got their cameras early. Everyone else was waiting months and some are still waiting (for the D800E especially)! Don’t expect to find the Nikon D600 in stock for purchase when it is released; they will get snapped up quickly! You should pre-order the D600 now if you want to be sure to get it on time. 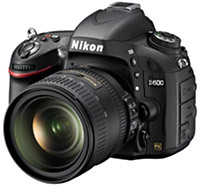 This page contains is a list of retailers offering the Nikon D600. Many offer pre-orders and have generous return policies if you decide you want to cancel early or return the camera later. Below is a list of popular retailers who offer the latest Nikon cameras such as the D600. Not all list the camera just yet, but as soon as they do we provide links directly to the product page to pre-order the Nikon D600. You can also find the latest links with updated information at the top of this page. Bookmark it and check back often! Amazon 30-day return policy, no restocking fee. B&H Photo B&H has a 30-day return policy and does not charge any restocking fee.Note: B&H may authorize the order total on your credit card when you order. This is a temporary hold that will automatically drop off after a few days. Adorama Adorama offers a 30-day return policy and has no restocking fee. Adorama will not charge you until the order ships! OneCall OneCall has a 30-day return policy, you are not charged until your order ships. Samys Camera 30 day return policy. 15% restocking fee will be charged for opened digital cameras. Abe’s of Maine 30-day return policy. No restocking fee provided terms are met. Unique Photo Unique Photo offers a 14-day return policy (also available in store). Nikon has a minimum advertised price policy, so all retailers will sell the D600 camera for the same price. You may also find that by ordering online you will get free shipping and not be charged sales tax. Local retailers will add sales tax to your purchase. Your best bet is to find a retailer offering the D600 with terms and return policy that meets your needs. See the pre-order list on this page for ordering options. Many retailers will not actually charge you until the camera is delivered. In addition, a generous return policy will allow you to change your mind later should the camera turn out not to meet your needs. Beyond the internet ordering options, you may also buy the Nikon D600 though a local camera dealer. Often your local camera shop may have a list, sometimes requiring a deposit. You will also have to pay sales tax. But chances are the local shop will get a few D600 in and if you are one of the first on the list, it may be better than being farther down the long list at a big mail order retailer. This is one area where small dealers in small towns may be able to beat the big guys. There are also chain stores, the biggest of which is Best Buy. They are in the unique position of being local, but having the purchasing power due to their size and number of stores. Each store may only be allotted a few cameras (2-3 in the case of the D800) at first release, but if you get in the door first or call ahead at just the right time, your Best Buy may have the Nikon D600 available. Best Buy also often lists new products for pre-order just like the other Internet dealers, but their Internet division only has a certain number of cameras available for pre-order and will remove it quickly once they sell out their allotment. Typically after Nikon makes a new camera announcement, it will take around a month before the camera is shipped to dealers. However in the case of the D600, Nikon ramped up production and will deliver the D600 starting on September 18, 2012. If you buy on a pre-order, you can relax knowing that you’ll be first in line. Retailers won’t know exactly how many cameras they will receive, so they may not be able to quote you a firm delivery date. If you get in on the pre-order early, don’t sweat. You’ll get your camera. Retailers are treated equally by Nikon; they receive regular shipments and switching your order to another store often won’t get you your camera any sooner and may place you further down another list. Pre-orders are filled based on your order time, so when the camera announcement is imminent, be ready to place your pre-order. Bookmark this page and return to find the latest list of retailers offering the Nikon D600 pre-order. This page will be updated frequently with direct links to order the D600. By using these links we get a small commission from the sale. We hope you enjoy and value our advice, and wish you good luck getting your D600 before everyone else! Enjoy!